See you at Padang Merdeka! The organisers of Miri Marathon (MM), Borneo Marathon (BM) and Kuching Marathon (KM) are pleased to announce that once again special recognition will be accorded to marathoners who have signed up, took part and completed full marathon race of all 3 events within the official cut-off time in next year 2018 series. 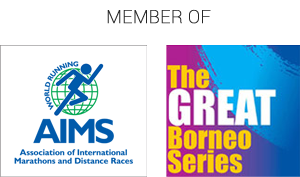 This will be the second year after the collaboration of “The Great Borneo Series” (“GBS”) was inaugurally and successfully formed in 2017 to give special recognition to runners for their efforts in joining and completing all 3 Full Marathons with passion and style. An unique online platform is now under construction and will be launched soon. This single common platform will ease runners the registration process of all 3 events with one single point of registration and payment gateway.For those who are interested to sign up 3 events, kindly bear with us for the time being. We shall launch the online registration portal by November 2017. Kindly follow our FB for further update and announcement. Copyright © 2019 Kuching Marathon. All Rights Reserved.